New Mexico – Land of Enchantment. I could not agree more, especially if your definition of enchantment includes friendly people and delicious green chile. Although the purpose of our recent trip to the Land of Enchantment was to deliver our Water Loss Control Training Program to water utilities, it also provided an opportunity for me to learn a little more about New Mexican culture and how that ties into water resource management in this arid region. In route to our first training class in Espanola, Heather Himmelberger, Director at the Southwest Environmental Finance Center (our partner in this initiative for the New Mexico Environment Department), educated me on the history and complexity of water use rights in the state. ‘First in time, First in Line’ was the phrase I learned that reigns supreme in New Mexico. That was my first lesson that water is looked at differently in the southwest. As participants rolled into our training session on Monday morning in Espanola, I began to introduce myself. New to the Non-Revenue Water (NRW) arena, I kept my ‘industry’ comments general and let the small talk unfold. I spoke with one gentleman and asked him if he had the opportunity to attend any of the previous sessions provided earlier in the year. He had, and he was very complimentary of the training content and expressive of the value in learning the basic concepts of water loss and the tools available to reduce such loss in his community and other water utilities across the state. As he listed the training aspects he enjoyed; the presenters, the water audit software, the decision processes toward water loss intervention, and the challenges that utilities, like his own, face in this important conservation practice. And this is where he paused. ‘There is something else….that I cannot put my finger on. I think it’s the coming together of these utilities and sharing ideas.’ That moment was the recognition and mutual acknowledgment that all the training and tools in the world will not help issues of water loss without a side-by-side approach with a change of culture; the way we look at the loss of this crucial resource. That culture, as I learned from Heather, will vary from region to region for different reasons, but witnessing the willingness to change it for the better was the highlight of my trip, by far….ok, the green chile was very close. Create a water balance. All of the water going into a distribution systems should, in theory, equal the amount of water going out of the system. Specifically for water loss control, we want to separate Non-Revenue Water into Unbilled Consumption, Apparent Loss and Real Loss. Test the validity. The AWWA Water Audit Software produces a Data Validity Score & Metrics screening to help the utility assess whether their data is valid and reasonably confident to continue further in the process of Component Analysis. 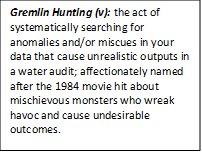 If the Data Validity is low, then that suggests a reevaluation of the data is necessary – or as we like to call it, gremlin hunting! Component Analysis. Analyze the components of Unbilled Consumption, Apparent Loss and Real Loss. Use volumes & values. Plan & Implementation. Prioritize the components to make a plan to control apparent and real losses. It’s through these basic concepts, water utilities can begin to get a clearer picture of where their water loss is occurring and what can be done about it — also known as ‘audit to action’ — rather than conceding that it is simply unaccounted for. As utilities walk through the water audit exercise, they begin to see how important the data from their water systems really are. Now, back to the culture of change mentioned earlier. Water loss control is beneficial to all water utilities; small and large. Like many municipal positions, these operators are tasked with performing multiple roles with limited resources. Before being exposed to the water audit process, it is not hard to imagine that some utilities may feel like they have limited options to control their losses. Even after the initial encounter with the Water Audit Software, some utilities may feel overwhelmed if they realize they have issues with their data, or in some cases, their data is not archived in a readily usable format. Let’s call this the initial resistance to something new that most of default to. 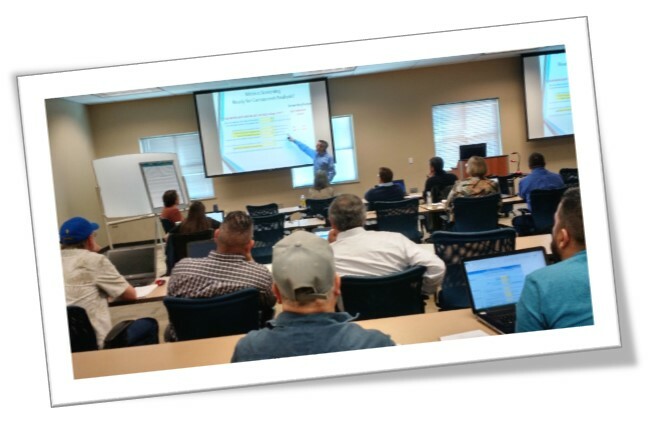 The rewarding part of this training program is when those utilities that once thought controlling their water losses was insurmountable, understand that this process gives them a place to start regardless of their current position. Who has not felt overwhelmed or lost, and wished they just had a restart button to push, or better, a detailed process to guide them toward a better way. We saw more of these light bulbs turn on throughout the week. One example, was during a discussion on meter inaccuracies with our small water systems and options available to perform meter testing. As the consensus around the room became apparent that each utility just did not have the resources to purchase or maintain the equipment need to perform meter testing, it was proposed that each utility pool their resources to obtain this equipment as shared-use. Another example was less an ‘ah-ha’ moment for a particular utility than it was a realization for me that all utilities have unique circumstances; be it geographical, hydrological, regulatory, financial, environmental, etc. We had a nice conversation with a large water system that helped us understand the challenges of water resource management loss an arid region, but most importantly, the overwhelming need for a water ‘audit to action’ plan in place for financial and conservational purposes – in short, becoming a steward of our earthly resources….and that makes us very happy. We look forward to our return trip to the Land of Enchantment in a couple months for our 4th & final training circuit in this phase of the program…..Stay tuned.